The first author to achieve a consecutive win of the German Crime Prize, Schenkel has won first place for both The Murder Farm and Ice Cold. The Murder Farm begins with a shock: a whole family has been murdered with a pickaxe. They were old Danner the farmer, an overbearing patriarch; his put-upon devoutly religious wife; and their daughter Barbara Spangler, whose husband Vincenz left her after fathering her daughter little Marianne. She also had a son, two-year-old Josef, the result of her affair with local farmer Georg Hauer after his wife’s death from cancer. Hauer himself claimed paternity. Also murdered was the Danners’ maidservant, Marie. THE MURDER FARM by Andrea Maria Schenkel was originally published in Germany in 2006 and translated to English and issued in the United States in 2014. The story is based on a true story about a gory murder of an entire family in Germany in 1922. The author resets the scene to a 1950 rural community in southern Germany. The story is told by a former resident who returns to his village after learning about an unsolved heinous crime in which farmer Donner, his wife, his daughter, her two children and a maid are brutally murdered with a pickaxe. Locally, the Donner farm is known as “The Murder Farm”. The story unfolds in short chapters as local residents associated with the crime tell their stories in the first-person to the former resident. The author also presents a few chapters in the third-person and invokes short prayers in others. Each chapter involving an interview with a resident shows that person’s relationship with the Donner family. Much of the information comes in the form of secrets and gossip. Farmer Donner comes across as a very unlikeable character who degraded his wife, forcibly slept with his daughter and the new maid and mistreated many prisoner/workers during WWII. Slowly the author provides information and possible motives that allows the reader to piece the murder together. Andrea Schenkel packs a lot into this short 168 page novel. Her unconventional way of presenting the story in short chapters of interviews is the strength of the novel and offsets the less than interesting characters. Additionally the subtle way she reveals motives and clues and presents an image of a small village still suffering from WWII is well done. 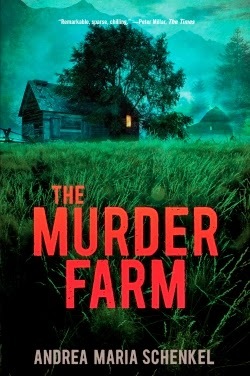 I recommend THE MURDER FARM to anyone who enjoys a good crime thriller. I do like books like this especially when they're based on true stories! What Kathy said... I like true stories like this as well. I am intrigued! Kid Konnection: The Zoo is Closed Today!